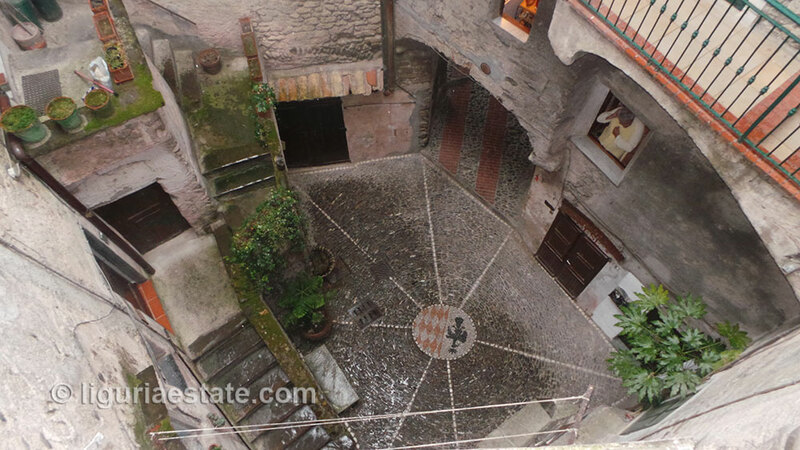 In the romantic historic medieval town of Dolceacqua close to the famous bridge, which has been painted by Monet in 1884, is this beautiful large apartment for sale 110 m². Dolceaqua is located in the province of Imperia (Liguria region). All primary facilities are present here such as; a grocery, a pharmacy, restaurants, bars, etc., and at a distance of only 15 min from the beach. Long ago the apartment was the observation post of the Doria family’s gards, to guard the bridge and the village from hostile forces. The apartment consists of two levels, with beautiful old original floors, vaulted ceilings, old fireplace and original stone seats built into the bay windows (once for the guards). The apartment is located in the highest part of this historic building and the outside part of top floor (20 m²) can be converted into a beautiful roof terrace. Although the apartment has for the most part a fairly high standard and is directly suitable for habitation, there is also a part that standing in an unfinished state in itself. We can imagine that you might have refurbishment or renovation wishes. Liguria Estate has specialized over the past 10 years in acquiring local permits, constructions and renovations, Project Management and other necessary work. We are happy to serve you! We also provide architectural and design services taken care of a licenced architect.